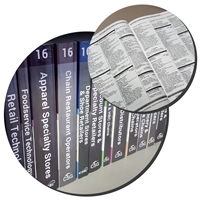 Chain Store Guide, the leading provider of contact information for over 80 years, has the contact directories for the major companies you are looking for. Our printed directories offer thousands of contacts, phone numbers, and addresses for the companies that will net you the biggest gain. By utilizing a series of strict criteria for inclusion, CSG prequalifies the leads contained in each directory as those possessing the highest sales potential; thus saving you time and money. Indexed, sorted, and easy to search through, these directories will help you to quickly identify all your potential customers. Each includes thousands of companies, with in-depth information such as sales revenue, number of stores, industry specific data, and much more.